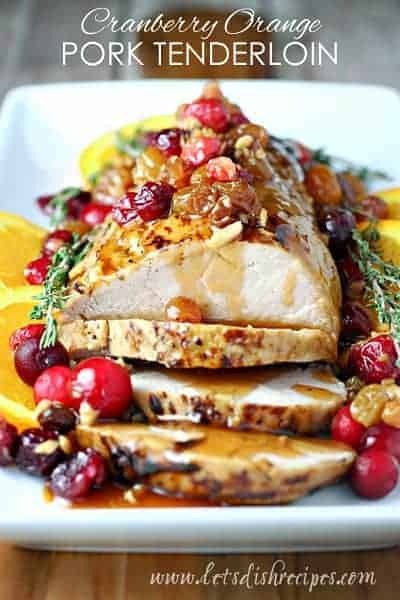 This Thai Peanut Pork Tenderloin is marinated and roasted in the oven, then topped off with a slightly sweet, slightly spicy sauce with hints of peanut, orange and lime. 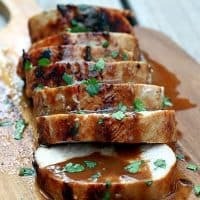 It’s one of my family’s favorite ways to eat pork tenderloin, and that’s really saying something, because we eat a lot of pork tenderloin around here! I always keep a pork tenderloin or two in my freezer. It’s my favorite cut of pork–maybe even my favorite cut of meat, because there are so many ways to prepare it. I know it’s tempting, but don’t skip the step of searing your meat. It adds so much flavor! And let your pork rest for about 10 minutes before slicing into it to seal in all those juices. This dish is great served with rice and a side of grilled veggies–which also go well with the delicious sauce. Combine marmalade, garlic, coriander, cumin, soy sauce, rice wine vinegar, peanut butter, lime juice, orange juice, crushed red pepper and black pepper in a small bowl. Whisk until smooth. Season the pork tenderloin with salt and pepper and place it in gallon sized resealable plastic bag. Add the marinade. Squeeze the air out of the bag and seal. Preheat oven to 425 degrees. Heat the vegetable oil in large oven-proof skillet (like cast iron) over medium-high heat until shimmering. Add the pork tenderloin, and sear on all sides, until it’s nicely brown, 8-10 minutes total. Place the entire skillet into the preheated oven, and cook for about 20 minutes, or until a meat thermometer registers 160 degrees. Let stand 10 minutes before slicing. While the pork is cooking, pour the marinade into a small saucepan with 1/4 to 1/2 cup of water. Bring to a boil and simmer until slightly thickened, about 5 minutes. Slice the tenderloin and pour the sauce over top. Sprinkle with chopped cilantro for garnish. Had neighbors in for dinner tonight, we ordered Thai, but I had a pork tenderloin in the fridge that I wanted to use as well. Who Dished It Up First: Adapted from Tide and Thyme. This looks amazing, love the flavors!!! Have you ever done this on the grill? I might try it this weekend.. sounds delicious! Put this on the grill last night, it was delicious! My hubby cannot stop raving about the marinade/sauce. Even though we just had this last night, he is using the same recipe tonight at work on grilled chicken skewers. Definitely a keeper! Is there anything that could replace orange juice? I know that’s odd, but we don’t drink it! 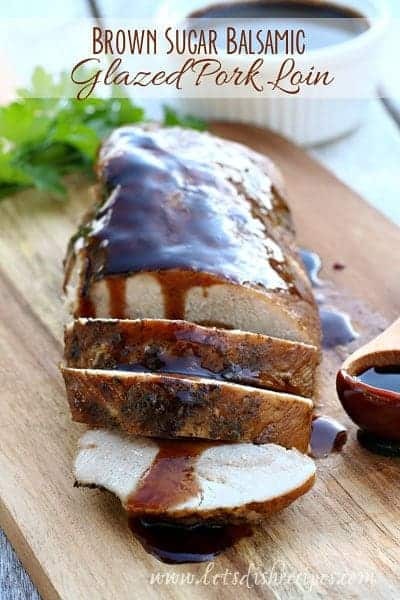 This recipe looks amazing, I’m really wanting to try it! Hmmm….that’s a tough one. I’d say since there are so many other flavors and spices in the marinade, you could just replace it with water and still have great flavor. Maybe ad a bit of orange zest if you don’t want to use juice? So nice to hear! 🙂 Thank you! Had wonderful neighbors in for dinner tonight, we ordered Thai, but I had a pork tenderloin in the fridge that I wanted to use as well. 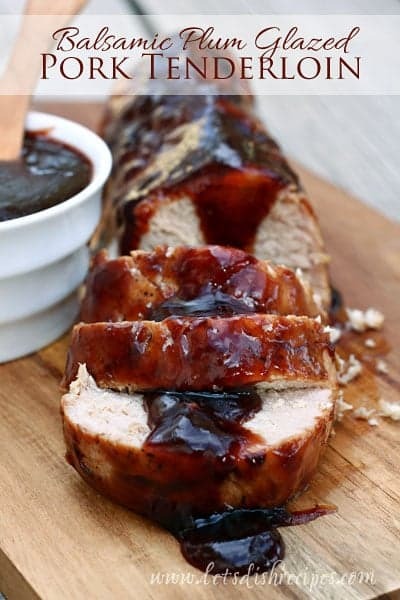 So… why not look for a Thai pork tenderloin recipe I thought. Came upon this and thought it looked good. Huge hit, thanks very much it was delicious! I read that Lyne serves hers with baby bok Choy .that I just happen to have in the fridge presently. I’ve never made it as a side before, does anyone have a good recipe for baby bok Choy as a side ? We loved this recipe! The sauce is fantastic. I want to put on grill for a larger group of guests. I see a few of you did this. How do I adapt the recipe for grilling? Thank you! 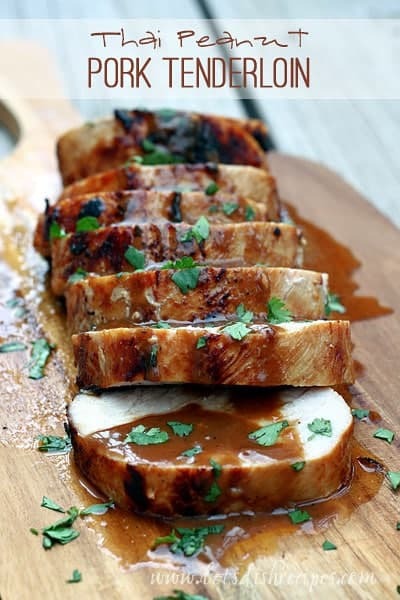 I’ve never done it on the grill, but I would just google how to grill pork tenderloin. And use a meat thermometer to make sure it was the correct internal temperature. I think you could skip the step of searing it in the pan, since the grill will take care of that. Hi. This looks delicious. Do you cover the dutch oven when in oven? I usually use a cast iron skillet, and I do not cover it when in the oven.